The easiest way to determine home value is to hire an appraiser. Generally this will cost $350 to $700 to value your home. But if you prefer a more economical alternative we will present one below. At Dr Cash Home Buyers we approach home value as an investor. The first step, and perhaps the most important, is to determine the After Repair Value (ARV). The ARV is defined as a house that has been upgraded or remodeled to the current standards of the local market. It is a house that is in good to excellent physical condition and will qualify for a retail buyer's loan. A retail buyer is one who intends to live in the house. The ARV is usually arrived at by analyzing the values of similar houses that have sold within the last six months or so. This is called a Comparable Sales Analysis or some similar term. In this analysis the other houses must be similar in age, size, number of bedrooms and bathrooms, and within a fairly tight radius of the subject property. Unfortunately the sales numbers of recent area homes are only available to real estate professionals such as realtors. Without this database of past home sales a homeowner can make a reasonable estimate of ARV by studying the properties currently for sale in the area. This information can be found on the website of the local realtor organization. The asking prices are NOT final sales numbers so some downward adjustment may be necessary. If any of these systems are lacking in physical condition, or sometimes local building codes, then corrective action has to be taken. These major systems can be very expensive to repair or replace. 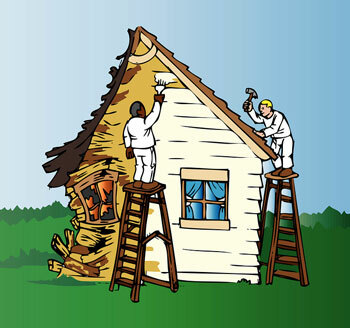 Once the investor or homeowner has made the repair estimates for the home, the next step is to calculate the selling costs by way of a traditional sale of real estate. The traditional method is to sign a contract with a realtor, have showings and/or an open house, waiting for a retail buyer to qualify for a house loan, and pay the realtor 6% of the value of the home if he or she is successful in selling it. The remaining amount is the equity of the homeowner. So let's study an example. In the example below we are assuming only one major house system needs repair/replacement - the roof. We are also assuming that the rehab/remodel expenses are moderate at $12 per sqft x 2500 sqft house = $30,000. In addition, an investor will have to resell the house after repairs and will incur various closing costs including a realtor commission. The math is below and it represents a common investor analysis. Remember, in this example the investor is buying the home in "as-is" - fair physical condition. Many investors rely on a "shortcut" to determine the value of a house they wish to buy. They will calculate the ARV as mentioned above. From that point they will deduct 30% of the ARV and then subtract the remodeling/repair expenses from the ARV. See the example below. Both methods of determining the home's value yield similar results. Investors would typically offer $135,000 to $137,500 for the purchase of this home in "as-is" condition.